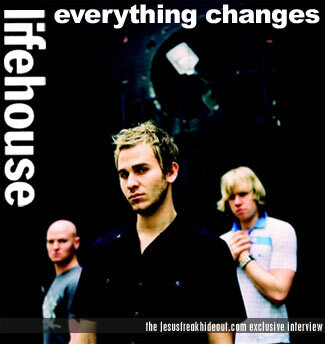 Jesus freak Hideout: How did you get started in music and with Lifehouse? Jason Wade: I started playing acoustic shows when I was sixteen. Made my first demos when I was seventeen. Got signed a little bit later on and it wasn't until I met Rick that I started touring. Rick Woolstenhulme: My dad would take me to his gigs when I was little.... Once I stole my brothers drum set, it was all over. As for Lifehouse, I was rehearsing in a room next door, and would pass Jason all the time without meeting him. When I found out they needed a drummer... I showed up to audition. It was me up against 2 twelve year olds. I win! Bryce Soderberg: The band started out with the name "Blyss" with Jason as the core founder around 1997. He was discovered by a producer and manager and they helped him get a record deal. 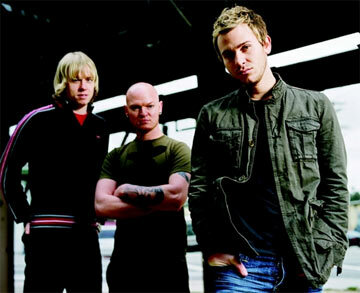 The name changed to Lifehouse in 2000 with the major label debut... Individually, we had all been listening to and playing music for most of our lives, we all met in LA through friends. JFH: How has the pretty quick success of your debut and "Hanging By A Moment" changed your view on life or even just songwriting? Jason: I feel that "Hanging by a Moment" gave the rest our songs an opportunity to be heard. The only problem with that song is the temptation to recreate it in some way. I feel it is best to just keep moving forward and hopefully your audience can grow with you. Bryce: It has been one of the biggest contributers in establishing our career. We are excited to see the crowd reaction at shows... it gets one of the biggest respones. Many people tell us that it affects them by being a song that is important to their relationship. Jason: Bryce has been a great addition to our band. His positive energy and excitement for the music has been very inspiring. Rick: We have seen a slight increase in the female population... other than that, the rock is still rocking. Bryce: Many bands go through member changes to find the proper blend. This one fits. As long as Jason doesn't bail, we're great! We couldn't go on like Van Halen or AC/DC. JFH: Let's talk about your new debut DVD release "Everything." Did you have a hand in the project at all? Jason: We definitely had a hand in the creative process on our DVD. We were especially excited about the fact that some of our unseen videos would get the chance to be seen. Rick: The DVD is a live performance... us in the middle of our U.S. tour... we wanted to keep the vibe from our live performances. Bryce: We shot that in Portland in May of 2005. It turned out to be really cool. It's funny, the guy recording the show on pro tools didn't hook up the acoustic guitar track to the computer. The acoustic songs that you watch on the DVD ("You and Me," etc.) were recorded in Seattle the next night, and edited to match the footage from the night before. JFH: What is the story behind the video concept for "Blind?" Also, how did you end up working with Tina Majorino for the video? Jason: With the video "Blind," we wanted to capture through someone else's eyes what it is like growing up in a dysfunctional home. It is basically my story told by someone else. Tina was amazing to work with she is so talented. Rick: We are supporters of the Napoleon Dynamite movement, and we were lucky to get Tina Majorino in the video. She did a great job, even without the sideways pony-tail. Bryce: The story is about a girl who has a bad relationship with her father. Tina did a really great job, she's a terrific actress and a nice person. We were big fans of Napoleon Dynamite. I think our manager or label picked her for the role. JFH: What artist have you never worked with that you would really like to? Rick: Radiohead, The Shins, or maybe U2... there are many. JFH: Is there anything you'd like to achieve with Lifehouse that you haven't yet? Jason: My main goal with Lifehouse is to keep growing and maturing on our records. I feel when you stop evolving you need to call it quits. Rick: We want to be a band thats around for years making great records. If we can keep topping ourselves creatively, we'll be good. JFH: What's next for the band? Jason: We are currently getting ready to do another record. We have a few more shows in August and then its going to be all about writing and recording. Jason: We are planning to post on our website little snippets of new songs that will be featured on our new record. Go to Lifehousemusic.com if you want to check it out. Bryce: Yes, if you ever screw up our name, call us something creative like Livestock or Lifestyles... not Lighthouse... See you this summer!